The Sieckmann line is my father's line. This surname, while not extremely rare, is also one that is not extremely common either. My Sieckmann ancestors came from what is now northwestern Germany in an area that used to be the principality of Schaumburg-Lippe. In Germany this surname was spelled Siekmann, until the family migrated to America and the spelling was changed to a more American spelling "Sieckmann or Sieckman." Starting with our immigrant ancestor and counting the generations down from him, I am in the 5th generation of American Sieckmanns who descend from his line. 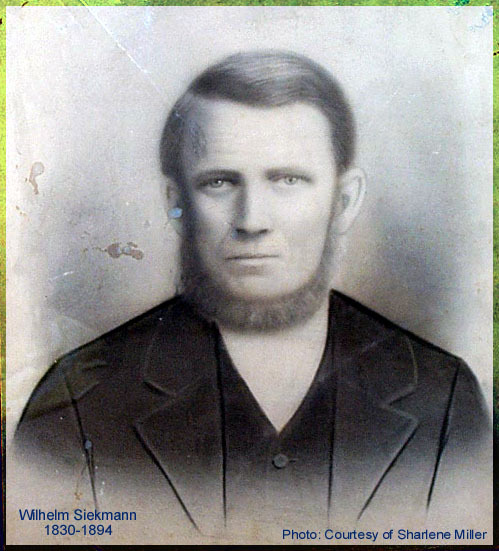 Our immigrant ancestor was Wilhelm Siekmann. My sister and my 2 first cousins are the last descendants in my grandfather's line to carry the Sieckmann surname. 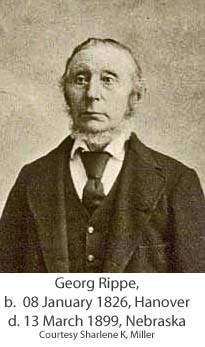 He was my 2nd great -grandfather. The reason he and his family emigrated to America is not known, but most certainly they hoped for a better life than the one they were leaving. At the time of their emigration the family that consisted of his wife, Minnie, and their five children. They left their home in the village of Rolfshagen in May of 1870. They probably traveled north to Bremen to board a ship which took them across the Atlantic Ocean. The 1870 census documents that some of the family resided with Wilhelm's older sister and her family in Monee, Will County, Illinois. My interest in genealogy began with my Sieckmann line. I have been fortunate to have lots of help from others, who were more experienced than I was. They have taught me a lot. I would like to thank the people who have helped me the most with researching this line: Delores Lowe, her daughter, Karen Rowe and Angelika Schierhölter, who lives in Schaumburg, Germany. If I had not had help from these three people, I doubt that my genealogy would have progressed as it has. My Rippe ancestry is from my mother's paternal line. She and her sister were the last children from her direct line to carry the Rippe surname. This particular Rippe line consists four generations of Rippes, who lived in America. All spent at least part of their life in Fillmore County, Nebraska. The immigrant ancestor for this Rippe line was Georg Rippe, who came to America sometime before 1857. The first record found for him in the U.S. documents that he purchased land in Will County, Illinois. Georg's children (generation 2) eventually left Will County, Illinois and migrated west in search of land. Son, Ernst, homesteaded in Fillmore County, Nebraska. Eventually, Henry Rippe, Sr., a brother to Ernst also moved his family to Fillmore County, Nebraska. For more information about Henry, Sr. and his family please see Generations. My grandfather, Henry Edward Rippe, Jr. (generation 3) lived his entire life in Fillmore County. He married Louise Albertine Wilhelmine Hintz and they were the parents of my mother and aunt (generation 4). The purpose of this website is to share information about this family and to connect with others who have an interest in the Rippe families connected to this line. It is to be a site for sharing information with one another. If you have any information, stories, photos, documents or other items pertaining to this family and would like to share them with others, please contact me. I would like to encourage you to contact me if you are interested in corresponding about any of the projects listed on this site. I welcome your questions and queries and am interested in corresponding with you if you are researching any of these families. Please see Contact Us page for complete contact information.